When the LORD your God brings you into the land that you are about to enter and occupy, and he clears away many nations before you– the Hittites, the Girgashites, the Amorites, the Canaanites, the Perizzites, the Hivites, and the Jebusites, seven nations mightier and more numerous than you– 2 and when the LORD your God gives them over to you and you defeat them, then you must utterly destroy them. Make no covenant with them and show them no mercy. 3 Do not intermarry with them, giving your daughters to their sons or taking their daughters for your sons, 4 for that would turn away your children from following me, to serve other gods. Then the anger of the LORD would be kindled against you, and he would destroy you quickly. 5 But this is how you must deal with them: break down their altars, smash their pillars, hew down their sacred poles, and burn their idols with fire. 6 For you are a people holy to the LORD your God; the LORD your God has chosen you out of all the peoples on earth to be his people, his treasured possession. In Neil Gaiman’s novel, American Gods, there is a scene where the main character, Shadow, enters an endless room of forgotten gods. This uncountable number of gods’ followers have vanished from the earth and they have vanished as well, passed away from the memory of time or history. The desire of this and other passages in Deuteronomy desire that the gods of these other nations would also be destroyed and wiped away from the memory of the peoples and the remembrances of time. This is a difficult passage for it calls for a divinely authorized extermination of other peoples and cultures. The word behind you must utterly destroy is the Hebrew word herem and sensitive interpreters should feel uncomfortable with this commands for the genocide of these other nations. It stands in contrast even within Deuteronomy for the mercy they are to show to the alien in their midst with the contrast that they are to show no mercy. This is a part of our scriptures and it, like many other passages, are something we should engage and wrestle with as we come to determine how we will use this and other passages in Deuteronomy and throughout the bible. As a Lutheran pastor I try to follow a hermeneutic that is similar to Luther’s in what I do. Luther’s hermeneutic views the bible through the lens of Was Christum treibut (what pushes Christ) (Wengert, 2013, p. 5) and while I will use many lenses when trying to interpret scripture when it comes to authority, as a Christian and particularly as a Lutheran Christian, it is this coherence to the revelation of God in Jesus that forms the canon within the canon for my interpretation. So the command in Deuteronomy to utterly destroy cannot command a greater authority for me to ‘love my enemies and to pray for those who persecute me.’ (Matthew 5.43 paraphrased) Yet, too frequently Christians have been all too willing to enter into wars or campaigns to wipe out other religions, in particular our Jewish and Muslim brothers and sisters, as well as other groups of Christians. Another point in this passage is it demonstrates two among the possible responses of a group of people encountering a religiously pluralistic world. One response it to eliminate that religious pluralism by force, to wipe out the other peoples and gods to provide a place where everybody can believe and practice in the same manner. This has been a response at innumerable places and times throughout history. In our world it may be difficult for modern people to understand when we see the world very differently than those who viewed the outsider as a contamination of the purity of their worship and group and therefore a threat to their holiness. However, we still see religiously and secularly motivated attempts at genocide happen in our time as well. The second option is to pull away from the surrounding society, and that option is also demonstrated in this passage when they are commanded not to intermarry. This is still an option that many religious groups undertake in our society today. Yet for most people of faith destruction or isolation are not options in their pluralistic world and so they have to find a way to live distinctively in the midst of the surrounding culture. 7 It was not because you were more numerous than any other people that the LORD set his heart on you and chose you– for you were the fewest of all peoples. 8 It was because the LORD loved you and kept the oath that he swore to your ancestors, that the LORD has brought you out with a mighty hand, and redeemed you from the house of slavery, from the hand of Pharaoh king of Egypt. 9 Know therefore that the LORD your God is God, the faithful God who maintains covenant loyalty with those who love him and keep his commandments, to a thousand generations, 10 and who repays in their own person those who reject him. He does not delay but repays in their own person those who reject him. 11 Therefore, observe diligently the commandment– the statutes, and the ordinances– that I am commanding you today. How can I give you up, Ephraim? How can I hand you over, O Israel? How can I make you like Admah? How can I treat you like Zeboiim? My heart recoils within me; my compassion grows warm and tender. I will not execute my fierce anger; I will not again destroy Ephraim; for I am a God and no mortal, the Holy One in your midst, and I will not come in wrath. Hosea 11.8f. Those who have read my work on Jeremiah know that I approach the book of Jeremiah from the perspective of a wounded God who is mourning the broken relationship between God and God’s people. Perhaps a disengaged god is easier to manage, or a god who dispassionately answers prayers but this is not the God of Israel, the LORD presented in the Hebrew Bible or the New Testament. This choice of God also involves commitment from Israel, to be chosen is to be held to a different standard, to be called to be a distinctive gift to the rest of the world. The people of Israel and the people of the Church will both fail in this calling, and yet the persistent calling of God remains. 12 If you heed these ordinances, by diligently observing them, the LORD your God will maintain with you the covenant loyalty that he swore to your ancestors; 13 he will love you, bless you, and multiply you; he will bless the fruit of your womb and the fruit of your ground, your grain and your wine and your oil, the increase of your cattle and the issue of your flock, in the land that he swore to your ancestors to give you. 14 You shall be the most blessed of peoples, with neither sterility nor barrenness among you or your livestock. 15 The LORD will turn away from you every illness; all the dread diseases of Egypt that you experienced, he will not inflict on you, but he will lay them on all who hate you. 16 You shall devour all the peoples that the LORD your God is giving over to you, showing them no pity; you shall not serve their gods, for that would be a snare to you. In the worldview of the Deuteronomist where obedience to the LORD of Israel and blessings are directly correlated there is no need for any other gods. The LORD is promising to provide for the people fertility in their homes, flocks and fields, freedom from illness and all the blessings they need to be an abundant people. This is an exclusive covenant that the people have been offered and the continual fear of the Deuteronomist is that the people will be led astray by the people of the land to follow these other gods. On the positive side this is concerned with passing on the faith and the story of the way their LORD has been active on their behalf from generation to generation. Yet in the midst of the continual return to this theme there seems to be an underlying fear of the loss of their children or their children’s children to these other seductive faiths. The loss of the children to the faith is a fear that is present in most religious bodies, certainly in the United States with the changes in the broader culture there has been a lot of concern about the decline of Christianity in the United States. Recently the Pew Research Center released a study where the number of people who are unaffiliated is now larger than both Catholics and mainline Protestants and the number of unaffiliated is growing rapidly while all major groups of Christians show decline (report at: http://www.pewforum.org/2015/05/12/americas-changing-religious-landscape/). I know a lot of congregations are dealing with the anxiety that their children or their grandchildren are no longer active parts of their congregation or any congregation. Perhaps in our own time and situation of digital pluralism the biggest concern of the faithful is no longer other religions but rather other competing ideals. In a world of almost infinite options for how time can be utilized and the expectation that people of all ages will be involved in a wide array of activities from sports to work to politics to entertainment or shopping. Although the struggle of the people of Israel entering into the promised land and encountering other people with new sets of beliefs and practices was challenging and different than our time, there is always the allure of these alternative images which are seen in the street, schools and marketplace. In every generation the congregation of the faithful has to wrestle with how they will remain faithful in their time and pass on the faith to the next generation to enable them for their own journey in their own time. 17 If you say to yourself, “These nations are more numerous than I; how can I dispossess them?” 18 do not be afraid of them. Just remember what the LORD your God did to Pharaoh and to all Egypt, 19 the great trials that your eyes saw, the signs and wonders, the mighty hand and the outstretched arm by which the LORD your God brought you out. The LORD your God will do the same to all the peoples of whom you are afraid. 20 Moreover, the LORD your God will send the pestilence against them, until even the survivors and the fugitives are destroyed. 21 Have no dread of them, for the LORD your God, who is present with you, is a great and awesome God. 22 The LORD your God will clear away these nations before you little by little; you will not be able to make a quick end of them, otherwise the wild animals would become too numerous for you. 23 But the LORD your God will give them over to you, and throw them into great panic, until they are destroyed. 24 He will hand their kings over to you and you shall blot out their name from under heaven; no one will be able to stand against you, until you have destroyed them. 25 The images of their gods you shall burn with fire. Do not covet the silver or the gold that is on them and take it for yourself, because you could be ensnared by it; for it is abhorrent to the LORD your God. 26 Do not bring an abhorrent thing into your house, or you will be set apart for destruction like it. You must utterly detest and abhor it, for it is set apart for destruction. I hereby command you: Be strong and courageous; do not be frightened or dismayed, for the LORD God is with you wherever you go. Through Moses the people are reminded of the way God has acted for them in the past: that they were a people who were rescued from the superpower of their day and who the LORD has sustained throughout their journey. If the LORD can handle Egypt, the LORD can handle these nations that are before them. They are not to fear these nations for they will be slowly driven out before the Israelites but they are also not to covet what they have. The lure of the silver and gold the nations have committed is to be dedicated to destruction. They are not to take an idol and value it for its components, instead they are to destroy it rather than risk the wrath of their LORD. They are not to try to secure their own wealth and prosperity in the land but rather their relationship is one where they are dependent on their LORD to provide their prosperity and blessing. They are to resist the materialistic urge to procure their own security through the captured wealth of these nations but rather they are to rely upon the abundance of the blessings the will receive in this land flowing with milk and honey from their LORD who brought them into the land. 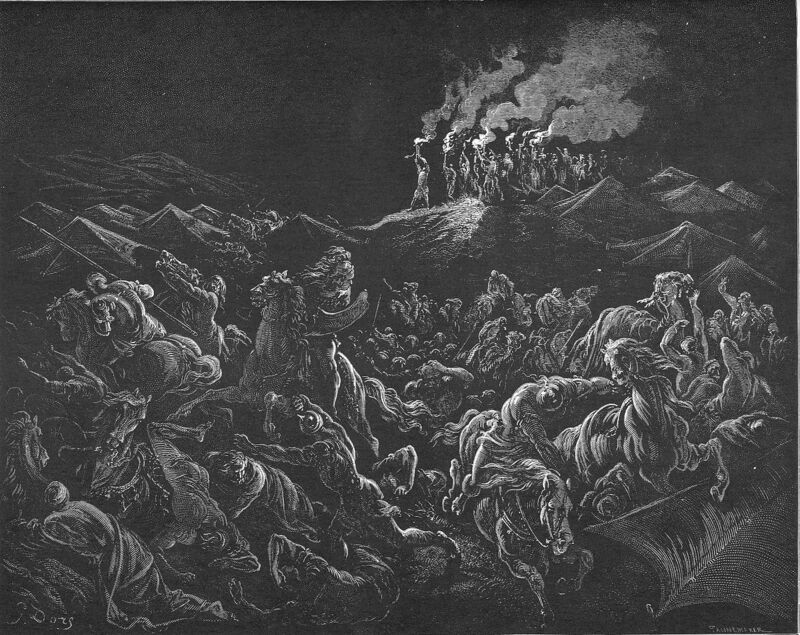 This entry was posted in Biblical Reflections, Deuteronomy and tagged Election, Genocide, Israel. Bookmark the permalink.